‘Milk was my first inspiration. 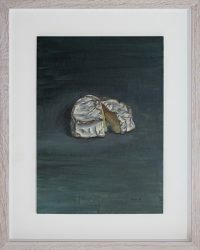 As Clifton Fadiman said… ‘Cheese – milk’s leap toward immortality’. 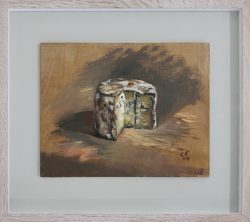 It started at 41 New Road in 1992 in my Acme studio in the old Jewish quarter of Whitechapel… On the window ledge in front of the beautiful decaying period 1840’s wallpaper, a half bottle of milk had gone off, so I decided to paint it. It was the beginning of my journey. 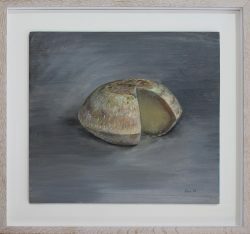 A good cheese is a pleasure to look at as well as to eat. I want these cheeses to have the whole gamut of human emotions in them with all the drama of opera. There’s feeling in every dab of creamy impasto paint. I can lose myself in a melting cheese. In my studio, a truckle becomes my world while I am focused on it. 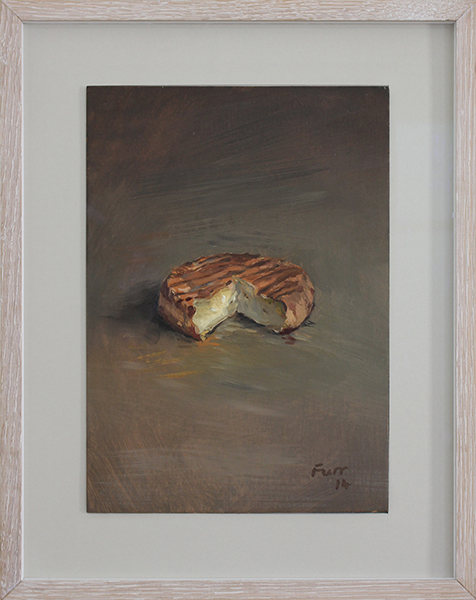 Do not miss this exceptional opportunity to purchase an original ‘Furr Cheese’ painting by a true master. In 1995, aged just 28, Christian became the youngest artist to paint HM Queen Elizabeth II after being commissioned by the Royal Overseas League. Christian’s successive works have adorned the walls of the Saatchi Gallery, National Portrait Gallery, Royal Society of Portrait Painters and in the private collection at the Vatican. In 2004 Furr was awarded the Association of Colleges Gold Award at the House of Commons given to further education alumni who have gone onto to achieve excellence in their chosen field. 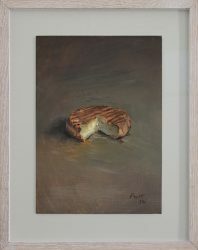 Highly sought after for his portrait commissions, the superbly talented painter simultaneously followed the strong tradition of representation in British modern and contemporary art throughout his oeuvre. A cheese by Christian Furr will take pride of place in your home and be something to truly cherish for generations to come.